In 2005, significant progress was made within the context of the RNTS R-MOD project, concerning the 3D reconstruction and functional exploration of the airways. 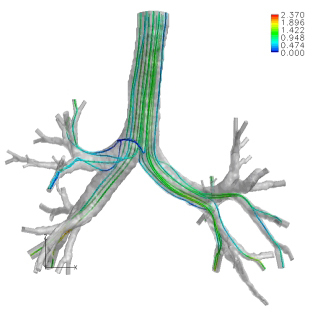 The results concern, the first simulations of air flow within the bronchial network and, secondly, the development of new tools for 3D segmentation and analysis of the upper airways in the context of a concerted study with Air Liquide, INSERM and INRIA. A test platform integrating the simulator has been deployed on the Air Liquide site to study respiratory system diseases on a real scale and to specify inhaled drug delivery protocols.